Merle Jones, 74, is a welding instructor at the Jacksonville campus. Merle has been involved in welding most of his life. 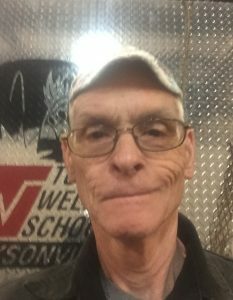 A graduate of Tulsa Welding School himself, this is Merle’s second stint as an instructor at our welding school. He came back to teaching in 2015. Merle is currently the Phase One night class instructor. Thanks for your time, Merle. When you were younger, what did you want to do when you grew up? I’d always enjoyed tinkering with automobiles and engines. My father taught at a university, and he wanted me to try college when I graduated high school. He knew that I wasn’t college material, so to make a long story short, I went to the Oklahoma State Institute of Technology on the Diesel Technology program. It was a trade school. About six months after I got out of there with my associate’s degree, I went into the Marine Corps for seven years. Thank you for your service, Merle. So this is you second time teaching at Tulsa Welding School? I was here the first time for five years, then I left for about eight years and went out on the road as a welder. I came back three years ago in 2015. When did you first start welding? My uncle, Melvin, was a welder and a mechanic, and I spent a lot of summers with him. There was some welding involved in the Diesel Technology program, but I didn’t get really interested until years later, when I moved back to Oklahoma to take care of my mom and dad. A friend of mine had a company, and I started welding on heavy equipment and stuff like that. I’d say I’ve been welding seriously for 30 years. I didn’t go to welding school until I was 56. I went to Tulsa Welding School in Tulsa. What made you decide to go to welding school at 56? It was my wife’s suggestion. I’d just finished up a job and didn’t know what I wanted to do. Kathleen suggested I try welding, as I’d always liked it. If something were to break anytime I was working with heavy equipment, I’d have to repair it and get back on the road. Back in 1988, I worked for a large wholesale nursery and put in hundreds of feet of 12″ pipe. We built catch ponds and pump stations to re-circulate water. We did all the fabrication of that, too. That’s when I really got interested in welding. I’ve always enjoyed being around younger people. You know how they give out the Top One award at Tulsa? Well, I received that when I was there. I told one of the owners that at some point I wanted to become a welding instructor, and low and behold, that came true down here in Jacksonville. I really hope that I can help change some peoples’ lives. Some of our students may have never had a goal to strive for before, or had the opportunity to be productive in life. For some, it may be their last chance to make a go of it. I don’t get into their personal lives, unless they want to talk with me one-on-one, but sometimes we get folks who have been incarcerated, and this may well be their last chance. I love to do woodworking, and I love to fly. My best friend in Oklahoma is an eye doctor, and we used to take his plane, a Cherokee 6, to Arkansas and places to go fishing. I really enjoy flying. I’m 74, but I still miss my mom and dad. I’d have a family dinner. My father was an educator. He had a PhD in education. He was a very strong influence on me. I didn’t think it growing up in high school, but after I got a little age on me, I realized how brilliant he was. I went to welding school after my mom passed away in 2001. Tthat’s really how that choice came about. She always encouraged me in everything. I guess if I were knowledgeable enough, I would have loved to have been a pilot. Make sure that you have good, reliable transportation and a good work ethic. If you have to rely on city transportation for seven months, it could be your downfall. Treat this experience as your first job in the welding industry. You are employed every day, so show up when you’re meant to, if not earlier, and put the work in. I tell my students that I can usually tell within a couple of weeks, what kind of individual they’ll be in the workforce. In my classes, I give a lot of advice about what will be expected of them when they go out into the welding industry. I try not to beat around the bush. I tell them if they spend as much time welding as they do on their phones, they’d all be extremely good welders. What would you do with an unexpected night off? I usually try to spend as much time as I can with my wife, as I am gone most nights for work, so we would do something together. Maybe we’d have dinner out. What did you enjoy most about your time in the field? I really enjoyed the traveling. Most jobs would last six to nine months. I worked for an industrial company for seven straight years, from St. Petersburg, FL, to California. I liked new construction on power plants and refinery shutdowns, and I worked on an above-ground mine in California. I don’t get to use it right now, but I have a rig truck that I really enjoyed using when out on the road. But as far as a tool I use a lot, I have a Speedglas automatic hood [welding helmet] that I’ve had since 2001. I spent a lot of money on it, but it’s made me a lot of money. If you were to tell someone “Thank You” for helping you become you, who would it be and why? I mentioned my father already, so I’d say my mother. She encouraged me to always do the best job that I can. I have a lot of traits from my mother. Also, my uncle Melvin who I mentioned, he always told me to do the best job I can all the time, not just every now and then.